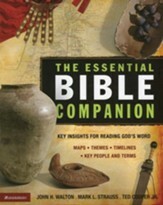 Explore the world of the Bible through this visual feast and increase your knowledge of God's Word. 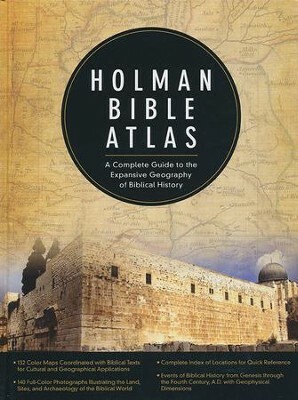 The Holman Bible Atlas illuminates the Bible for a whole new generation of students and teachers by introducing them to teh physical, cultural, and historical settings of the biblical narrative. Integrating insights from physical and historical geography, archeology, ancient historical sources, and the Bible itself, the Atlas presents 132 newly designed full-color maps complete with specific biblical texts to assist teachers and students alike in understanding. Beginning with the physical geography of the ancient Near East and the Levant, the Atlas illuminates various periods of biblical history by outlining eras from the Patriarchs through the Christian era and Constantine. By utilizing chart summaries, time lines, and more than 100 additional color photographs, the Atlas helps the reader visualize the setting of biblical events. John H. Walton, Mark L. Strauss, Ted Cooper Jr.
Ronald F. Youngblood, F.F. Bruce & R.K. Harrison, eds. Theres also a wealth of written and visual information regarding various people groups (Aramaeans, Moabites, Phoenicians, etc. ), great empires (Egypt, Babylonia, Rome, etc. ), and the road systems, agricultural year, and economic life of ancient civilizations based on archaeological recoveries. Thomas V. Brisco is Provost and Chief Academic Officer, Hardin-Simmons University. He also serves as Professor of Old Testament and Archaeology. Dr. Brisco came to Hardin-Simmons from Baylor University where he taught in the Department of Religion. Prior to that, Dr. Brisco taught for 21 years at Southwestern Baptist Theological Seminary, serving also as the Associate Dean for the Doctor of Philosophy Program. Dr. Brisco specializes in ancient near eastern history and archaeology particularly as these subjects relate to the historical, cultural, and geographical setting of the Bible. His archaeological field experience includes work at Tel Aphek and Tel Batash in Israel. An ordained minister with pastoral experience, Dr. Brisco has served as interim pastor in over 20 churches in Texas, Arkansas, Colorado, and Switzerland. Q: Are there clear overlays of current geography with cities as well as political boundaries? Is there and index that you can query for "this is the archeological site I am seeing, what happened here?" 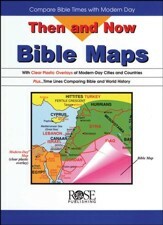 This book only contains maps keyed to Biblical times. There are no overlays or maps containing current day political boundaries. There is an index of people and places, and a separate map index, but they are based on the ancient historical names for the geographic locations. You can find out the history of a particular geographic location, you just have to know the ancient names for the area. Q: No Page Numbers?? 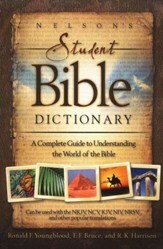 The one review of this atlas stated that the book had no page numbers. 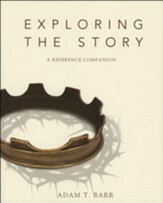 When I look inside the atlas at the Christianbook.com website I can definitely see page numbers. So, were the page numbers added after the reviewer posted the review? Was there an initial version that did not have page numbers? This item does have page numbers on the top, middle of each page. I'm the author/artist and I want to review Holman Bible Atlas: A Complete Guide to the Expansive Geography of Biblical History.